Abramtsevo is a wonderful place for artists and writers. Since the 1870s, many famous painters have visited it, including Vasnetsov, Repin, Serov, Korovin. Been there and Polenov. Abramtsevo manor was not a place of balls and meetings of notable people. This place was intended for creativity. It preserved the beauty and originality of rural nature, it was far from the bustle of the city. Maybe that’s why it was so easy to create famous painters. The painting Polenova shows a boat trip. In the summer heat it was nice to be among the surface of the pond under the shade of tall trees. The place looks picturesque. Water lilies littered the surface of the pond, the banks are buried in verdure and thickets of reeds. In the background, a large dried tree is hanging over the water. At different ends of the boat are two girls and a boy rowing with oars. The girls’ faces are not visible: one sits with her back to the viewer, while the other bowed her head and reads a book, part of her face hid the brim of the hat. The clothes show that these are not ordinary peasant women, but young ladies. The boy is also not rustic. He is dressed in the form of a sailor. Broken water lilies hung on the boat. A bright light falls on the boat and the people in it. It comes from above, through the crowns of tall trees. Along the perimeter of the picture is darkened. The boat becomes the composite center of the canvas. The water in the pond is green and calm. There is no hint of wind. Only light movements of oars disturb the mirror surface of the pond. 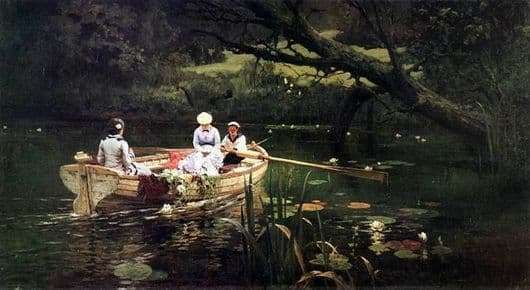 Those who are sitting in the boat have the same mood: calm, peaceful. Here is a great place for thoughts and reflections, for unity with nature. If you mentally transfer to the pond, you can imagine what sounds surrounded the characters in the picture. Surely they heard the singing of birds, bursts of water, the slight noise of reeds and the croaking of frogs. All this thanks to the talent of Polenov, who managed to so realistically convey the beauty of the pond.